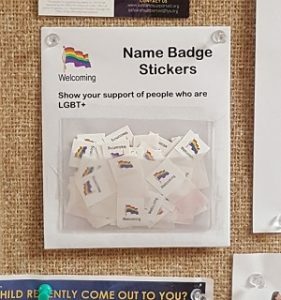 For some years, Heritage UU Church has offered rainbow flag stickers for people to put on their name badges, to show that they are supportive of Heritage Church being a welcoming place for people who are lesbian, gay, bisexual, transgender, and/or in other marginalized groups due to their sexual orientation or gender identity. At some point, we ran out of stickers, but now they’re back! You can get one at the LGBT Rights section of the social justice bulletin boards. Help yourself and show your support.